The Best Video Marketing blogs from thousands of top Video Marketing blogs in our index using search and social metrics. Data will be refreshed once a week. Video Marketing newsletter is a comprehensive summary of the day's most important blog posts and news articles from the best Video Marketing websites on the web, and delivered to your email inbox each morning. To subscribe, simply provide us with your email address. Facebook fans 168,034. Twitter followers 520,420. Facebook fans 46,772. Twitter followers 80,611. Irvine, CA About Blog The latest news, videos, and discussion topics on Video Marketing.Advice, insight, profiles and guides for established and aspiring entrepreneurs worldwide. Home of Entrepreneur magazine. Facebook fans 3,610,741. Twitter followers 3,426,279. San Francisco, Hong Kong About Blog Get all the information you need to start creating compelling animated videos, including eBooks, webinars, white papers and more. A blog about video marketing. Facebook fans 52,312. Twitter followers 56,153. Waterloo, Ontario About Blog Maury Rogow, CEO and executive producer at leading video production company Rip Media Group, shares with us the key formula they use to create great video. Facebook fans 6,078. Twitter followers 10,885. Facebook fans 7,751. Twitter followers 2,245. About Blog Video Marketing, Facebook Video Marketing, Instagram Video Marketing, YouTube Video Marketing, Online Marketing Experts. How to set up a youtube channel and why it is important. Facebook fans 4,286. Twitter followers n/a. About Blog Looking for custom whiteboard animation videos for your business? At wizMotions we convert your message into an engaging and hypnotizing explainer video. Facebook fans 3,389. Twitter followers n/a. Facebook fans 60,084. Twitter followers 22,770. San Francisco, CA About Blog The Best in Class Video Content Marketing.Reddit is a community of millions of users engaging in the creation of content and the sharing of conversation across tens of thousands of topics. Facebook fans 1,135,315. Twitter followers 499,309. San Francisco About Blog Create engaging infographics, videos, and ebooks for your marketing campaigns. We make premium content creation fast, simple, and affordable. Facebook fans 179,007. Twitter followers 135,910. Canada About Blog Read posts about Video Marketing on the Ecommerce Marketing Blog - Ecommerce News, Online Store Tips & More by Shopify. Interact with a community of savvy online store owners. Facebook fans 2,607,509. Twitter followers 11,047. About Blog Tubular Insights offers video marketing tips, research, and advice for digital marketers & video professionals. fka ReelSEO's Video Marketing Guide! Facebook fans 17,762. Twitter followers 46,973. New York, NY About Blog Read about video hosting, marketing, security and production on the SproutVideo blog. SproutVideo is a powerful video hosting platform for business. We provide video marketing, analytics, and security tools, and beautiful video websites to boot. Facebook fans 565. Twitter followers 1,664. Chicago About Blog Keep up with the latest news and updates from Video Brewery. We'll be posting online video tips, tricks and video samples. Facebook fans 435. Twitter followers 1,497. Chicago, IL About Blog Learn more about video marketing with our blog.We're an explainer video production company specializing in animated explainer videos, demo videos, corporate video and marketing video for business. Facebook fans 995. Twitter followers 1,624. Facebook fans 9,802. Twitter followers 25,328. Facebook fans 2,266. Twitter followers 5,619. Northwest Arkansas About Blog Stay up to date with great video marketing content! We discuss how to tell your story, latest video trends, and what goes into great video production. Facebook fans 922. Twitter followers 2,007. Washington DC - New York City About Blog Video Production in Washington DC.We are a Washington DC video production company creating Award Winning corporate videos for top brands. Facebook fans 1,005. Twitter followers 4,139. About Blog In-Depth Video Marketing Guides & Tutorials To Grow Your Business. The easiest way to create engaging videos online. Belgium About Blog StoryMe homepage with cases, video testimonials, navigation, video marketing, 1 minute video. We help companies win with Video! We're specialized in Video Production Video Strategy. Facebook fans 7,652. Twitter followers 1,927. London About Blog A brand communications professional who provides marketing and advertising consultation to clients worldwide, by combining the highest quality and strategic thinking to produce outstanding marketing solutions. Facebook fans 2,043. Twitter followers 47. About Blog We specialize in delivering highly effective video marketing campaigns for companies wishing to increase their revenues by better lead traffic, conversion and actual sales! About Blog Animated Video Blog - Explainer Videos - Online Animated Marketing Video Production Services.The Animated Marketing/Explainer Video Production Company makes Professional Animated Videos. Facebook fans 685. Twitter followers 126. United Kingdom About Blog Get professional advice and opinion from our sales experts and blog writers about social media marketing, technology, and video animation. Facebook fans 55. Twitter followers 14,657. About Blog Learn about the latest online video marketing industry trends, content strategies and video production tips on from the Web Video Marketing Council blog. Facebook fans 230. Twitter followers 8,203. SF Bay Area Edmonton, Canada About Blog Learn actionable tips on how to use video to engage customers and drive results. Facebook fans 1,144. Twitter followers 1,102. New York About Blog We write and produce explainer videos for tech marketing. They are used in content marketing strategies geared to the technology buyer's journey. Facebook fans 98. Twitter followers 1,454. About Blog We are a film production company, specializing in telling stories and helping companies and businesses get their message heard by a wide audience. Facebook fans 374. Twitter followers 1,517. Fort Lauderdale, FL About Blog Posts about Video Marketing Tips written by Ivan Hernandez. We provide quality graphical content that creates brand awareness and creates ROI. Facebook fans 82. Twitter followers 609. Calgary, AB About Blog At ChicFlicks, we want to help your business grow using the power of video. We are huge proponents of DIY video, so if pro video is not in your budget, we offer affordable solutions to help you master that producer in your pocket - your smartphone. We are your video marketing specialists. Facebook fans 594. Twitter followers 2,409. Birmingham, UK About Blog Corporate video production company in Birmingham and across the UK. Facebook fans 302. Twitter followers 1,647. About Blog The Official Youtube Channel for James Wedmore where he share his rants about video, marketing and other cool discoveries online! Facebook fans 96,706. Twitter followers n/a. London, England About Blog Video Production Company WebVideos helps businesses communicate more effectively with their target markets and existing customers. We do this using compelling video production. We provide content rich corporate video production that increase the value of a business' online presence, deliver a measurable return on investment and significantly contribute to the achievement of your business plan. Facebook fans 564. Twitter followers 2,369. Harlem, New York About Blog Clock Wise Productions offers Video Marketing, Production, Consulting, and Mentoring for Small Businesses and Solopreneurs. We help small businesses stand out from the crowd. Facebook fans n/a. Twitter followers 1,180. Toronto, Ontario About Blog Learn how to start making videos for your business and how to effectively produce, share, and measure your video content. Facebook fans 58. Twitter followers 2. Michigan, USA About Blog Hello! If you're a small business working on social media marketing and want to reach your tribe through the internet and social media, you've come to the right place. I will take and edit your videos, or edit the ones you have already. Facebook fans 243. Twitter followers 8,415. Zurich, London About Blog For all the latest news and discussion have a look at the Apex Video Marketing services Blog page and other related video services. Facebook fans 100. Twitter followers 156. Facebook fans 225. Twitter followers 174. Washington, DC About Blog The video marketing blog consist of the latest in video marketing, with advice for incorporating video in your content marketing strategy for maximum effect. Facebook fans 145. Twitter followers 303. Orlando, Florida About Blog News, Tips, & Advice for Video Marketing Success. VScreen is a leading Internet video marketing agency and production studio serving some of the most reputable brands in the country. Facebook fans 2,700. Twitter followers 2,336. Melbourne About Blog Sharing our passion for videos. Follow our blog and keep track of the latest tips, technology, ideas in the video production, marketing space. Facebook fans 601. Twitter followers 695. Facebook fans 2,052. Twitter followers 611. About Blog AdLaunch is easy to use video creation service that includes stock footage, pre-licensed music, ready made templates and team based workflow. Facebook fans 454. Twitter followers 1,052. Hopkinton, MA About Blog Insightful video marketing blog with useful tips on video content strategies, web video production, video SEO, video email marketing and video lead generation. Facebook fans 1,437. Twitter followers 1,210. Kennington, London About Blog Spectrecom is the UK’s largest independent film studio facility and production company. We love working with brands, agencies, universities and corporates. Facebook fans 682. Twitter followers 2,559. Los Angeles, CA About Blog Online video production, digital marketing, social media and PR for some of the coolest brands, businesses and startups on the planet! Facebook fans 2,120. Twitter followers 8,760. Mineola, NY About Blog A Long Island Web Design Company, that also specializes in many areas like, Advertising, Branding, Inbound Marketing, Web Design, SEO and much more! Facebook fans n/a. Twitter followers 1,947. Facebook fans 9,850. Twitter followers 1,205. Kerala, India About Blog Are you looking for a top explainer video production company? We create highly converting 2D animations and whiteboard explainer videos that people will love. Facebook fans 30,944. Twitter followers 1,510. Facebook fans 5,058. Twitter followers 526. 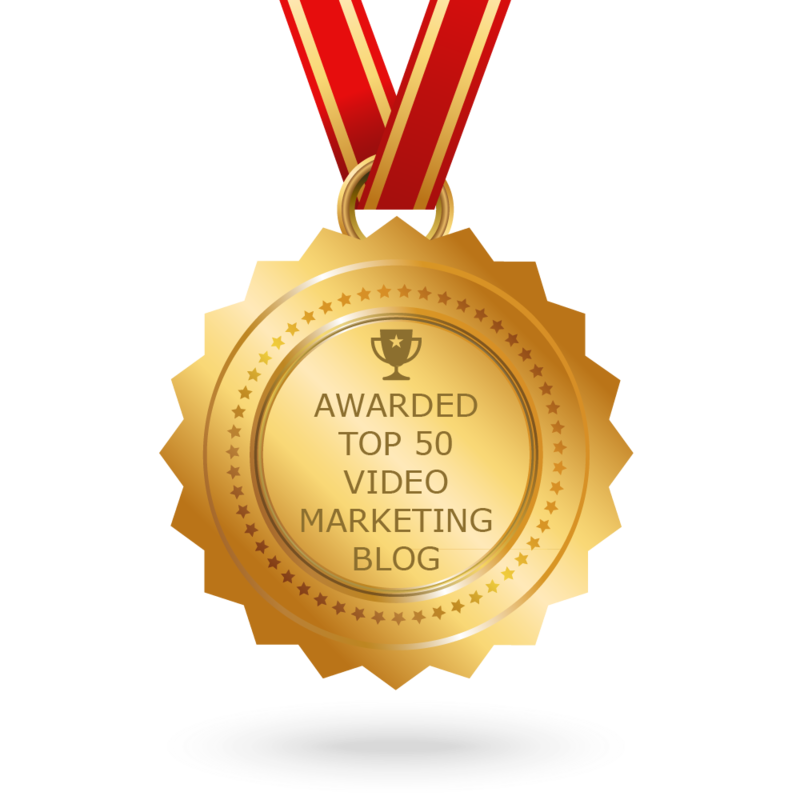 CONGRATULATIONS to every blogger that has made this Top Video Marketing Blogs list! This is the most comprehensive list of best Video Marketing blogs on the internet and I’m honoured to have you as part of this! I personally give you a high-five and want to thank you for your contribution to this world.